In the space of about eight months, MSNBC’s afternoon lineup of personalities went from Ronan Farrow to Brian Williams. By almost any measure, this has to be considered a step up -- despite the uphill battle Williams faces to rehabilitate his reputation and reestablish trust in his audience (should he be so lucky to attract one). His campaign to rebuild his image started on Tuesday afternoon -- at 3 p.m. Eastern, to be exact -- as Williams returned to the air for the first time since he was suspended last winter. The suspension was his punishment for the crime of serial embellishment unbecoming a TV news anchor (although such tales are not necessarily uncommon in this group). Basically, Williams told tall tales about his experiences covering hot spots such as the Iraq War, where he said the helicopter he was riding in came under fire, which it didn’t; and in New Orleans, where he claimed he saw a dead body in the aftermath of Katrina float by him in the French Quarter -- on a street where there was no reported flooding. This week, he was back in serious-anchor mode assuming the role that had been announced for him this past summer: “Breaking news anchor” for MSNBC. The newsworthy occasion for his return was the arrival on Tuesday afternoon of Pope Francis who landed at the U.S. military base in Maryland that is now called Joint Base Andrews. Williams wasn’t there. And happily, he did not claim to be. He said he was stationed at MSNBC headquarters in New York, and that appeared to be the case. 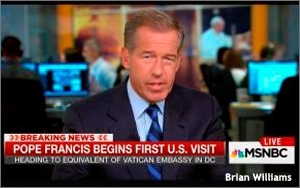 From there, he anchored the network’s coverage of the Pope disembarking from his Alitalia jet and greeting the Obama family and other dignitaries at the bottom of the stairway. As Williams has no doubt done a thousand times, he threw it to various NBC correspondents who were on the scene at Andrews. And he conducted a series of interviews with the likes of former U.S. ambassador to the Vatican Raymond Flynn and former New Mexico Gov. Bill Richardson about the meaning of the Pope’s U.S. visit. Richardson was booked to talk about the immigration issue, which is reportedly a subject the Pope is likely to take up with President Obama. How’d Brian do? Not surprisingly, he did fine. Anchoring coverage of live news events is something that should come naturally to him by now, and he acquitted himself with the polish and professionalism you would expect from someone with his background and experience. Meanwhile, though, the lovely Twitterverse was having at him with sarcastic remarks about what he would make up about himself and Pope Francis. Inevitably, someone composed a hashtag -- #BrianWilliamsPopeStories -- and away it went. “Wanted a drink, so I changed some water into a nice Merlot. Francis seemed impressed,” read one such tweet. “The Pope told me how impressed he was when I walked on water during Katrina,” read another. And therein lies the challenge for Williams and, by extension, MSNBC as the ratings-challenged news channel tries to manage its planned evolution from a network known for afternoon talk shows hosted by amateurs such as Farrow who nobody wanted to watch to an actual “news” channel that would emphasize breaking-news coverage during the day with experienced personalities such as Williams and Kate Snow, who followed Williams on Tuesday. The question for NBC News would seem to be: How do you accomplish a conversion to a hard-news approach if your lead anchor is to be ridiculed every time he comes on the air? One way of answering that question would be to wait and see how long the snarky tweets continue on social media, and also to consider the number of them. It is entirely possible that the exalted Twitterverse will demonstrate, as it often does, that it has a short attention span. It may come to pass that when it comes to Brian Williams, the tweets will subside and he’ll be able to get on with his life. Whether MSNBC can build an audience and grow the ratings in afternoons with this new approach is anybody’s guess. And there’s still a problem in prime time too. That’s the next question for the powers-that-be at NBC News: What to do about Rachel Maddow and Lawrence O’Donnell -- keep them around for next year’s elections or replace them now and go with someone else in 2016?